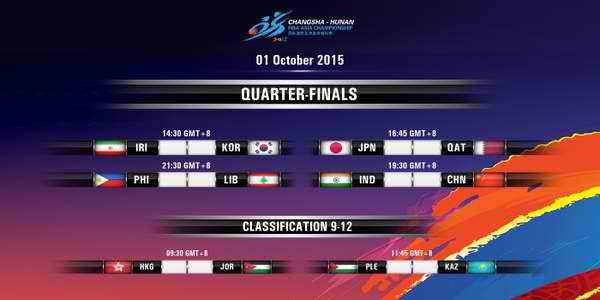 Day 7 - Quarterfinals: FIBA Asia 2015 Results, Scores, Stats & Video Highlights (October 1) - Balita Boss! Here's the result for Day 7 (October 1) of 2015 FIBA Asia Championship for Men Quarterfinals and Classfication Games. Iran and South Korea will collide in the first quarterfinal match of the tournament at 2:30 p.m. Iran booked a spot in the quarterfinal with 4-1 record, clinching the second seed in Group E, while South Korea having a 3-2 record in Group F seeded at third. Japan will face Qatar in the second quarterfinal match of the day in Changsha at 4:45 p.m.. Japan advanced to the quarterfinals with 3-2 record to finish third in the Group E and set up a clash against Qatar who place placed second in Group F, also with 3-2 record after the second round. China will put their perfect record on the line in their match against India at 7:30 p.m. China swept their group stage matches and placed as top seed in Group F, while India booked the last quarterfinal ticket in Group E with 2-3 win-loss record after the second round. Philippines and Lebanon will play at 9:30 p.m. in the fourth and final quarterfinal of this year's FIBA Asia, which serves as the regional qualifier for the 2016 Basketball Olympics in Rio de Janeiro, Brazil. Gilas Pilipinas with 4-1 record secured the top seed in Group E after defeating Japan, Iran and India in the second round. They will face Lebanon, the fourth seed in Group F with 2-3 record.